HubSpot also recommends this email newsletter lookbook. If you had to guess, how many email newsletters do you think you're subscribed to? Ten? Twenty? Fifty? To be honest, I've lost count -- and I know I'm not alone. Email marketers have a lot to compete with in their subscribers' inboxes. That's why a solid newsletter template is crucial to designing an email that people are encouraged to click through. However, "done well" means more than just serving up great content. In fact, an often overlooked component of the newsletter creation process is the design. Don't have time to build out a custom template from scratch? We've scoured the internet for the best resources for email newsletter templates and compiled them below. Once you find one you like, download the template and customize it to fit your needs. 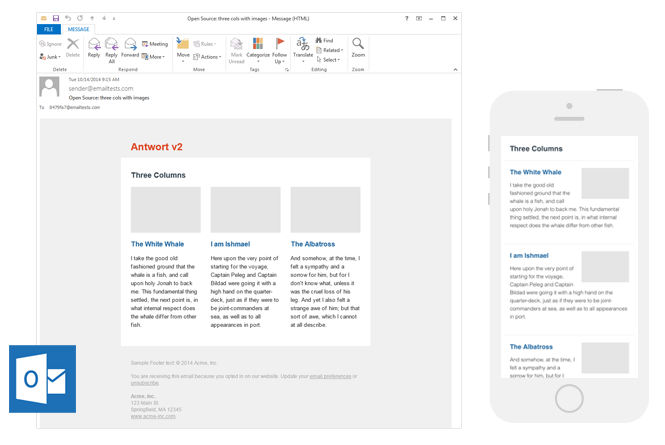 Litmus offers a free email template collection -- from newsletter templates to account management templates. The marketing-specific theme, below -- referred to as "Pook" -- is modern and sleek, while still being kind of fun. All of the templates have been tested with Litmus, and you can easily check out how the email will appear in different email clients here. 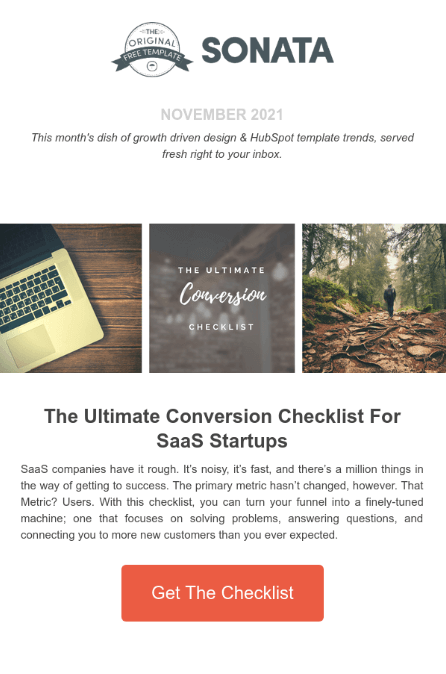 You can customize almost any component of the template below, from the company logo at the top of the email to the "Get The Checklist" CTA at the bottom. Get this template from the HubSpot Template Marketplace, which includes a full gallery of similar templates linked at the end of this article. 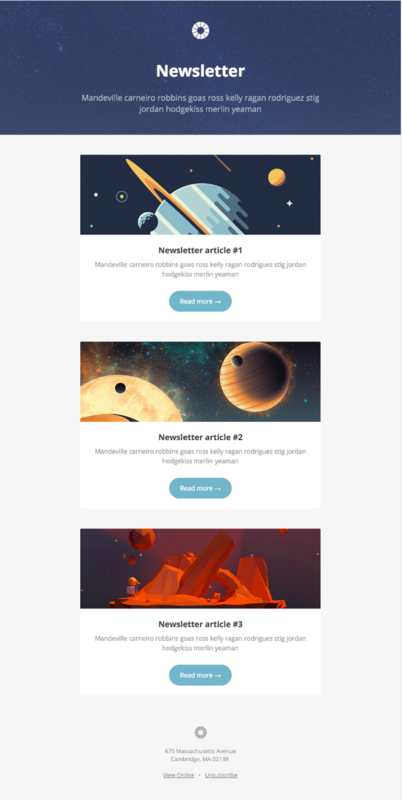 ZURB Studios has five responsive email templates available for free, including the newsletter one below. It has a great, fluid layout you can customize with your own colors, images, and wording. If you want to see how each template looks on different email clients, you can check out screenshots from each template's email client tests, which are on available the site. 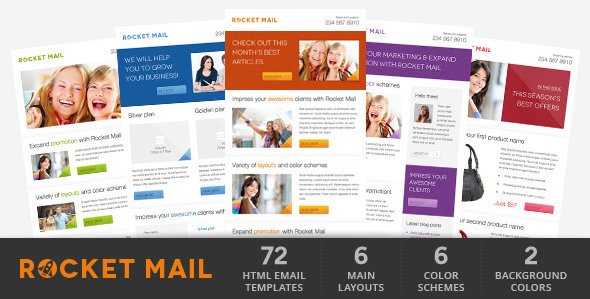 These layouts are optimized for most email clients -- except for Outlook 2007, 2010, and 2013. The template comes with a separate CSS stylesheet and HTML file to ease the editing process, and most clients put the CSS inline with the HTML itself after both are uploaded separately. If you're going to add images to your newsletter, keep in mind you'll have to create a separate folder and compress with the CSS stylesheet when uploaded. 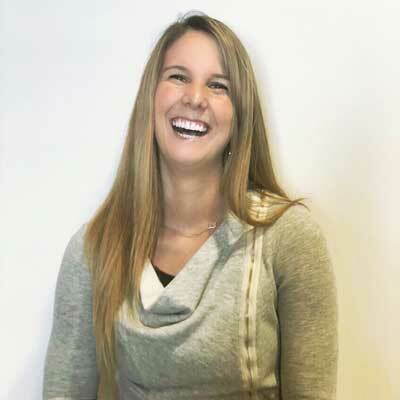 99designs is a growing online community and collaboration platform for designers and small businesses, and they have a great designer blog and business blog. As a free offering to their blog readers, they recently released a set of 45 free email templates -- perfect for newsletters, promotional messages, and personalized responses. 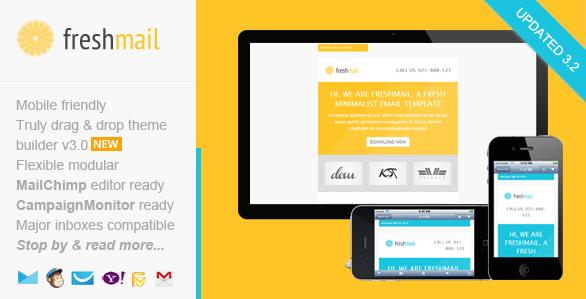 All of the templates are fully responsive and compatible with all major email clients. 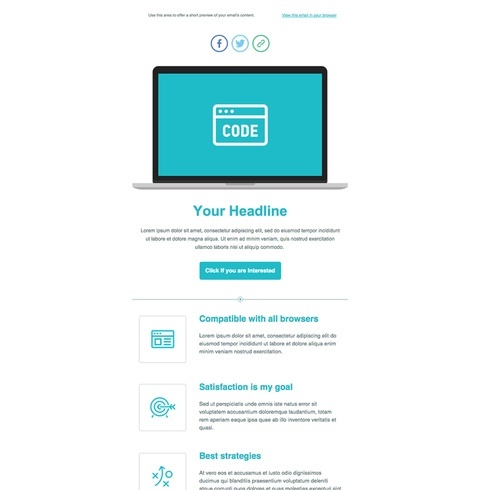 The email newsletter template below can promote anything from articles to new products, but it's particularly useful for promoting a webinar you want people to register for. 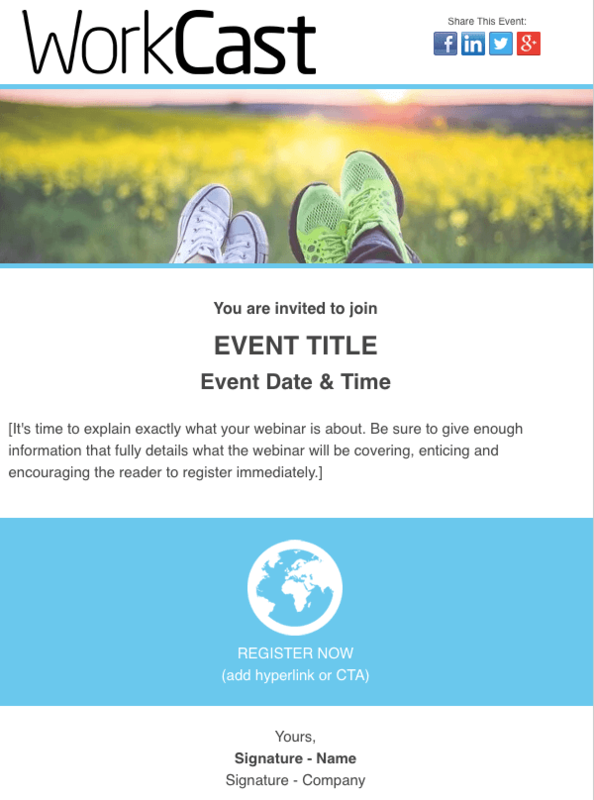 Developed by WorkCast for the HubSpot platform, the template below offers a healthy balance of text and graphics so you can grab your recipients' attention and give them the where and when of the webinar you think they'd be interested in attending. 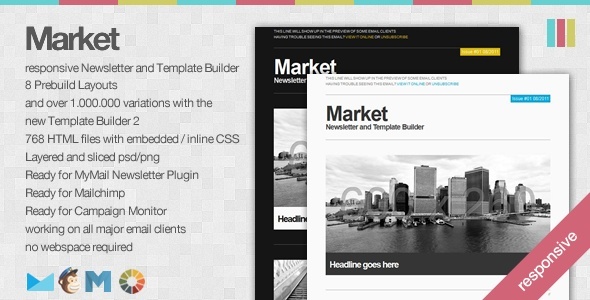 ThemeForest is an awesome resource for email templates if you have some budget to spend. Their library has over 460 newsletter templates in all different colors, styles, and themes. They're rated using a four-star system, and you can filter by rating, price, recency, and popularity. This template has eight prebuilt layouts, 24 color variations, 24 full-layered PSD files, and more. Plus, it's supported by all major email clients. Want a more minimalist look? This is a great template with minimalist design that's also flexible and repeatable, so you can easily arrange the layout and use it to build your own unique template. Even better, it comes with helpful documentation and video tutorials to help you make the most of the design. It works for all major email clients and is responsive to mobile. If you're looking for something more elegant and sophisticated, this might be the template for you. It comes in seven layout options and eight colors, along with six, fully-layered PSD files so you can customize as you wish. It works with all major email clients, is responsive to mobile devices, and includes helpful documentation so you can make the most of the template. 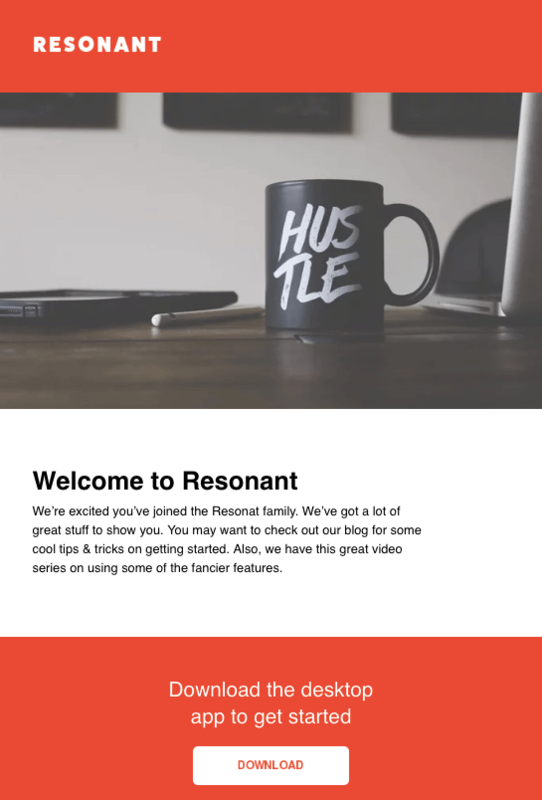 Resonant is another free email newsletter template by HubSpot. The template's base design is perfect for welcoming new users to your service. At this stage in the customer journey, you don't want to overwhelm your newest users with too much content right away -- but you do want to give them a taste of who you are. The wide image space at the top and text blurb beneath it help you do just that. 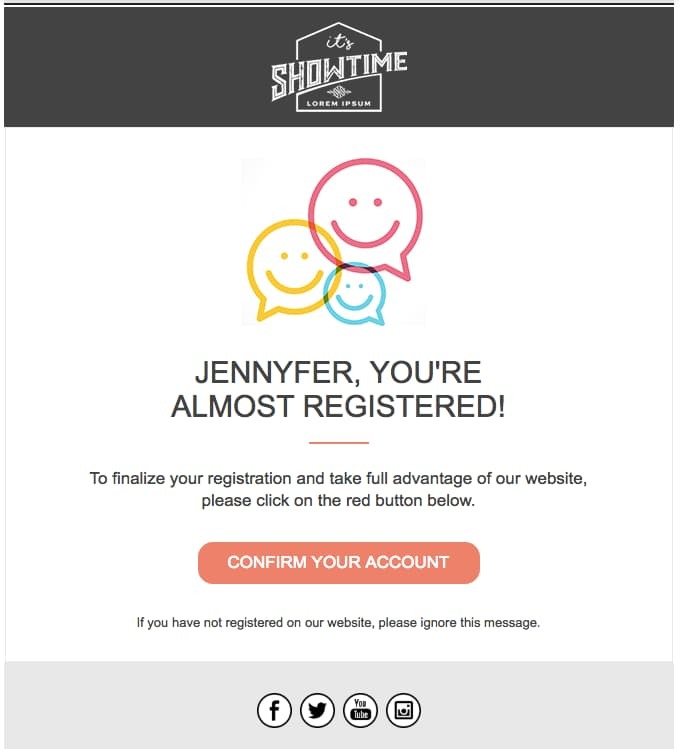 Maybe you want to send this email to help new users complete their registration, or offer them the next tier of your product. The "Download" CTA at the bottom of the email template gives you a modest up-sell opportunity, which you can personalize with any links and copy you'd like. 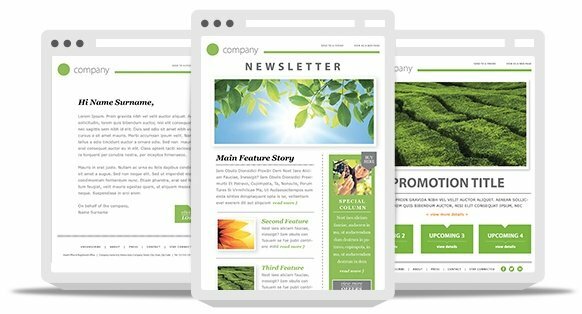 Antwort offers three newsletter templates: one single-column, one two-column, and one three-column. They're all responsive to mobile devices, so columns on desktop automatically condense on mobile devices. You'll notice they're pretty minimalist in design, which helps if you want to do a lot of customization work. They were also designed with dynamic content in mind. 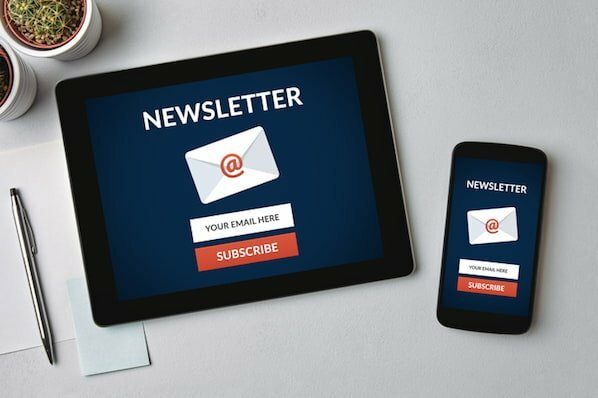 TemplateMonster offers a variety of email newsletter templates, such as the Useful Notifications newsletter template pictured below, all of which are available for relatively low prices. Their templates are clean, customizable, and easy-to-use, and they're compatible with most major email clients, such as Gmail and Yahoo Mail. Additionally, the templates come with built-in responsive layouts for screen adaptability, such as on the mobile phone pictured below, and PSD sources for a litany of customization options. 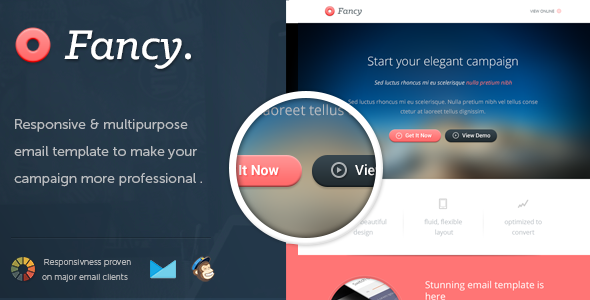 Download sixteen free HTML, CSS, and PSD sources of customizable email templates on Themezy. 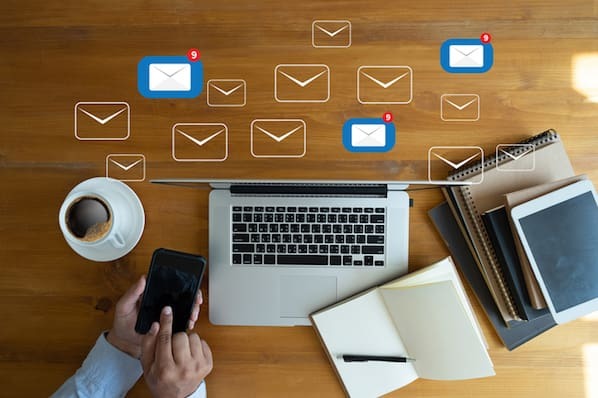 You don't have to submit an email address to get started, and there are various color schemes and layouts to meet your email list's needs. Plus, they're designed to be responsive across devices to ensure that your subscribers can read your newsletter. Email on Acid offers a free template with a basic, fluid design that's also responsive to mobile devices. In other words, the three different "layouts" you see below trigger based on the width of the recipient's screen. Although there's only one template here, you can actually mix and match each section of the layout to fit your specific design needs. The layout supports one, two, or three columns, and recipients on mobile devices will see the version that converts to a one-column layout for easy reading. 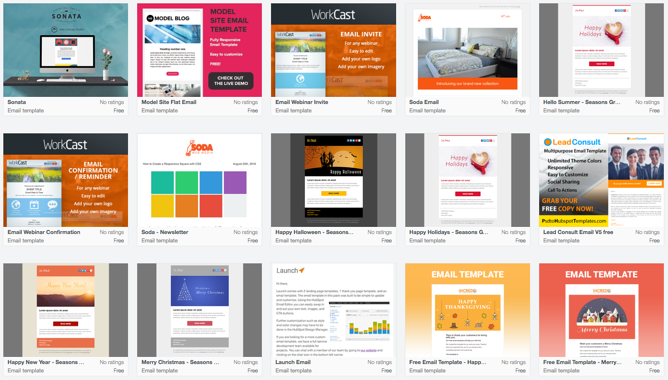 If you're a HubSpot customer, HubSpot offers a great collection of email templates you can download or purchase from our template marketplace. Paid templates are available for as low as $1, and once you buy a template, you can start using it immediately right in HubSpot -- no HTML or CSS required.